Intech's tooth modification to reduce tooth wear. This tooth modification was developed by Intech engineers who recognize that tooth wear, and not the tooth-root stress, is often the principal cause of gear failure in a non-lubricated gear mesh. Orbital sanding machines with an original steel-on-steel grease lubricated gear drive design used in the manufacturing of toothbrushes attracted airborne particulate and caused the formation of a gritty paste-like dust/lubrication residue that settled on both product and gears to create an assortment of process maintenance and quality issues. 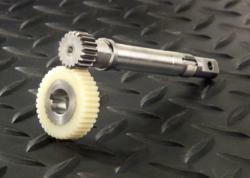 In an effort to curb problems resulting from the gear lubricant, the manufacturer required that the gears run without lubrication. The gritty dust and lubricant mixture created far-reaching maintenance issues that began to hamper production efficiency and affect product quality. Line shutdown for maintenance and replacement related to the gears was caused by frequent and premature tooth wear, tooth breakage, and gear misalignment. Increased backlash was affecting cutting uniformity and product quality, and the possibility of product contamination was an ever-present concern. When management set about upgrading its production operation to increase efficiency and gain economy, they selected Intech Power-Core™ gears as the major change agent to replace the steel-to-steel gear configuration. The self-lubricating Power-Core gears feature a cast-in metal hub, and eliminate both grease contamination and premature wear. Intech engineer, Tody Mihov, recommended tooth modifications that would extend gear life and yield more uniformity to the sanding operation. The tooth modification, aimed at increasing plastic tooth wear-life reduces the tooth-to-tooth sliding that commonly occurs when gears mesh. This tooth modification wBoth tooth wear and tooth-root stress are focal points of the proprietary Intech plastic gear-life performance calculations that are applied to each gear Intech produces. Proven calculations for self-lubricating Intech Power-Core gear material is based on test data developed over 10 years with a leading university. In addition to producing more consistent quality in the sanding operation, the manufacturer was able to realize additional performance benefits including longer gear life, quieter operation, and greater efficiencies. Intech Corporation was founded in 1983 by Georg Bartosch. We specialize in the design and manufacture of self-lubricating plastic gears, rollers, and cam followers made of non-hygroscopic Intech Power-Core™ material. We help customers reduce costs by running maintenance free motion components at higher speeds, with less down time, no lubrication, and requiring less energy. Low inertia, reduced friction, noise, vibration, contamination, and generally smoother running machines all contribute to lowering the impact of manufacturing on the environment. We like to think of our products as “Clean, Green, and Lean”.